* Final price depends on stairway length, options and your location. Manufactured by the most trusted name in the stairlift industry, this premium model comes packed with numerous features for both your safety and convenience that other models simply cannot match, all at a price that is surprisingly affordable. Safety and comfort are the hallmarks of the Acorn 130 Indoor Stairlift. A selfcharging DC power motor allows the lift to function even during a power outage. It's soft start/stop technology coupled with its state-of-the-art rack & pinion drive system make for a whisper quiet, incredibly smooth and comfortable ride. 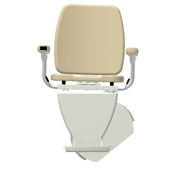 Ensures that the Acorn 130 Stairlift give the most comfortable ride available. 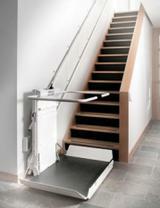 Stairlifts are fitted as standard for added security. The lower section of the rail folds up and out of the way when not in use, allowing greater access at the foot of the stairs. 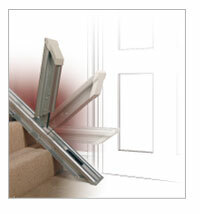 The option of a hinged rail is ideal when there may a doorway near the foot of the stairs. 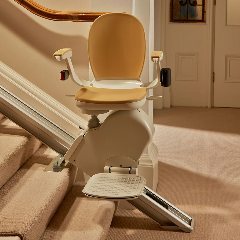 When the stairlift is not is use, the rail is neatly out of the way and causes no obstruction.